It’s an interesting story; thank goodness Reggie Black keeps me updated on practically everything that’s going on in the world and in my backyard. Since the barge arrived in Portland’s harbor on October 10, 2013, I’ve been thinking about a different kind of floating box. My father was not a hunter. Sure, he had a rifle in the closet, but he didn’t spend his time in the woods hunting. The late autumn machinations of men were unknown to me until I married a hunter. Even so, I was oblivious to what my ex-husband did every Saturday and I grew accustomed to being “widowed” for those November weekends, spending my Saturdays in blissful household routines sprinkled with coffee and antique hunting. A tree stand…what is that? Can I put a vase or a lamp on it? My life has changed and I’ve spent more time walking in the woods in the last few years. My eyes now recognize things I would have missed in the past. I see the black outline of the “store bought” stands that attach a flip-down seat or small platform to a tree. I can see the camouflaged tents hiding behind pine boughs. In some of my afternoon walks, I’ve observed the construction of a small floating box, rocking gently in the tree tops. It’s not gargantuan and high-tech, like Google’s floating box in Casco Bay. 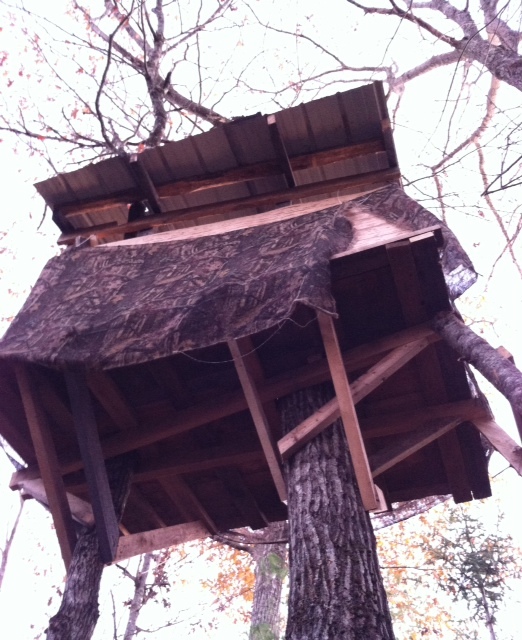 It’s more like the Shabby Chic of tree stands, made of wood scraps, repurposed siding, and plywood. I’ve climbed up a few of the ladder rungs, but then stopped myself, recognizing it as the private property of two young hunting men. I met them the other day and complimented them on their work. There are women who hunt and I’ve considered hunting as a way to spend more time walking in the woods. Perhaps I’ll hunt in the Apocalypse, but for right now, I’m content to leave the woods to the purview of my neighbors for a time. Deer hunting season “officially” begins today in Maine. It’s a serious time and I’ll exercise caution and wear hunter’s orange. I’m glad I can wear orange. I won’t be able to amble aimlessly across the fields like I’m in a Jane Austen novel or a Lord Peter Wimsey short story, but hunting season in Maine doesn’t last forever. The good news is that unlike Google, I don’t have to wonder what my neighbors are doing in their floating box. While I’m not privy to their patient introspection while they scan the edges of the field at dawn, I’m pretty sure they’re not trying to figure out how to rule the information ocean. This entry was posted in Weather and Seasons and tagged Deer hunting, Robin Follette, tree stands, what's Google up to?. Bookmark the permalink.